Slow Cooker Cream Cheese Chicken Chili - black beans, corn, Rotel, Ranch dressing mix, cumin, chili powder, onions, cream cheese and chicken. 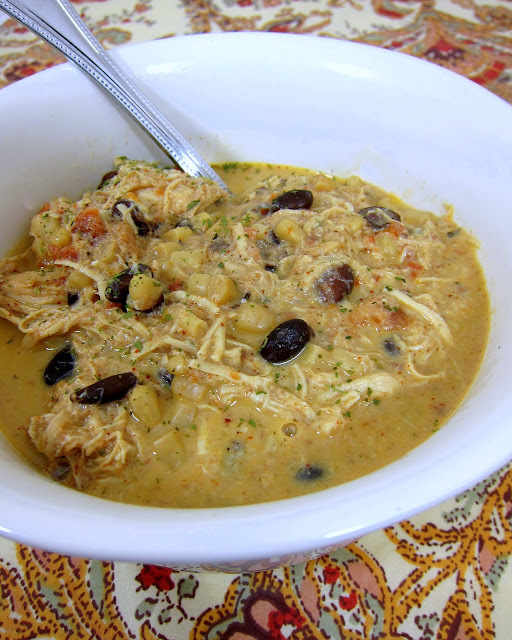 Slow Cooker Cream Cheese Chicken Chili - black beans, corn, Rotel, Ranch dressing mix, cumin, chili powder, onions, cream cheese and chicken. This chili is THE BEST! Everyone always raves about it. I love how simple it is. Can throw everything in a freezer bag and have a quick freezer meal later. We make this once a week during the cold weather months. It is officially chili weather in Alabama - brr. We usually do a traditional beef chili, but I saw this in my google reader and decided to give it a try. One word - amazing! It is made in the crockpot - my favorite preparation method. This only took 5 minutes to throw together before work. You could even mix it up the night before and just turn the crockpot on before heading out the door. The chili was delicious! We both loved it. It was even great reheated for lunch the next day. Drain and rinse black beans. Place chicken at bottom of pot, then pour out whole can of corn (undrained), rotel, and black beans. Top with seasonings and ranch mix. Stir together. Place cream cheese on top. Cover with lid and cook on low for 6-8 hours. Stir cream cheese into chili. Use 2 forks to shred chicken. Stir together and serve. Sounds yummy! Did you use frozen or fresh chicken breasts? Has anyone tried this with leftover turkey? I've made this many times before, and think it would be awesome with leftover turkey. In fact, you could probably just simmer it in a soup pot rather than using a crockpot if your meat is already cooked. Or put it in the crockpot for maybe 2 hours and stir it up. I actually tried this recipe this past weekend and loved it! Yes, you use frozen chicken breasts. It's a keeper! THe fact that I can use frozen chicken breats is awesome! This is definitely a keeper to try ! I'm making this for dinner tonight. My chicken was not frozen though...should that make a difference? Briggins810- the chicken will just cook a little faster if they aren't frozen. No taste difference. I am just using canned diced tomatoes and a can of green chiles. This sounds so good! One question is that two whole chicken breasts or two halves? Thanks! YUM! Must make this for the cold weather. Thanks for sharing! Do you post the nutritional information? Do you rinse and drain the black beans before putting them in? Marie - yes. Drain and rinse off the black beans and then dump everything in the crockpot. Why do you rinse and drain black beans? There is an enzyme in beans that causes gas. Draining and rinsing canned beans gets rid of this enzyme that has gone from the beans into the water. Yum! How many servings does this make? You may have answered the question about the serving size, but I don't see it. How many servings does this recipe make? This would be about 4 adult servings. The weather made us make chili too! we had this last night. Winner all the way around! I have this in the crock pot now. But it doesn't look like enough liquid?? The chicken will make some liquid as it cooks. Give it some time to cook down and if it still looks too thick, add water until it is the consistency you like. This looks great, Steph, especially all the spices visible on top. I just saved this one to try, it would be perfect for a busy weeknight and I don't use my crock pot enough. This looks great and easy....thinking I will need to double it for my family of 5 plus leftovers. And I'm wondering how great it would be cooked on high....I need it done in 5 hours today.....hmmm. I just found this on Pinterest! I wish I was having it for dinner tonight! Yummy. We ate this today and it is very very good. We will have this again for sure and it is really economical. Thanks for sharing. Keep up the good work and food. I didn't see whether you wrote about nutritional information. Jason - you are correct, just double everything if you want a double batch. Good luck! I'm cooking this in my crockpot now! I made this tonight and it was so very good. Thank you for all the recipes! I did use chili beans instead of black beans. Can't wait to try it. War Eagle! Made this tonight and it was TERRIFIC! I'd even make this when company is coming!!! We had this tonight and it was great! It was more on the thicker side and we had it with tortilla chips. We thought this would be great next time spread on tostada shells with lettuce and sour cream. Can't wait to try that! I heard a couple of my locker room buddies talking about this today and immediately my mouth started watering..too bad I don't have time to run home and get this ready for tonight... looks like it's on the menu for Friday or Saturday though! YUM! Made this tonight and it was *really* great, especially considering the minimal work needed. We used low-fat cream cheese and everyone loved it -- not too creamy or too ranch-y. Love the recipe box integration! This looks great! How many does it serve? Yummy!! Made it this week and was told i could make it again! I added a can of White kidney beans also. Assuming I should use boneless, skinless chicken? Making this right now. I didn't have Rotel and didn't want to run to the store so I just added diced tomatoes. It may not have all the spices the rotel does or the peppers, but I still think it will turn out wonderful. How well will this freeze? I like to make individual servings for lunch. Has anyone had any luck? So good! It is a definitely a keeper recipe! It's diced tomatoes and chilies. :) If you can't find it, get one can of each (the green chilies should be a 2-3 oz can) good luck! I made this last night, wasn't paying attention to the size of Rotel so I bought the big can, 24oz and used it all, and it still tasted delish. YUMMY. So excited to have the leftovers are lunch. Amazing recipe. I just made this last night. My kids and I loved it! Doubled the recipe to fit my slow cooker & tweeked the ingredients slightly (like using white corn w/ chipotle & 1 packet of regular ranch & 1 packet of fiesta ranch). Delicious!!! I keep finding your amazing recipes on pinterest. I am dying to make this. Can I use frozen corn? I am so happy to be following your blog. Andrea - frozen corn is fine. OH MY GOSH!!! This is SO freakin good!!! Best Chili I've ever had! We made this earlier in the week. It was really good! I doubled it and was glad I did, the leftovers where great. I made a double batch this weekend and sent it back to school with my son. It's so easy, versatile, and very nicely spiced as is. My son likes spice, so next time I'll use the hotter Rotel or add some chopped jalapenos for more kick. Thanks for posting! This looks so good! Do you cut up the cream cheese into cubes? Heather - I just dropped the block of cream cheese in and the heat from the chili melted it fine. This is by far my favorite chili. I've made it twice now. My family loved it, but found it too spicy, so this last time, I used one can of Rotel and one can of diced tomatoes (I doubled it for our family). The heat was perfect!!! Thanks for the great recipe!! Made this for a chili cookoff at work - it was fantastic. This is the only chili to date I actually like. Ridiculously good!!! I made this last week and when I was meal planning for this week my husband requested it AGAIN this week! So so easy and SO good! Great with corn bread! This is great! I don't care for Ranch Dressing mixes, they taste too "fake" to me, so I just used a half pouch of fajita seasoning and little bit of powdered buttermilk 1 tablespoon or so), and it was great. Also, I had frozen corn (loose) so I just filled the empty rotel can with the frozen corn, topped it off with chicken broth to make up for the lack of corn liquid, and we were good to go! When we reheated it the next day, we stirred in broken tortilla chips so it got some additional texture, and that was great also. 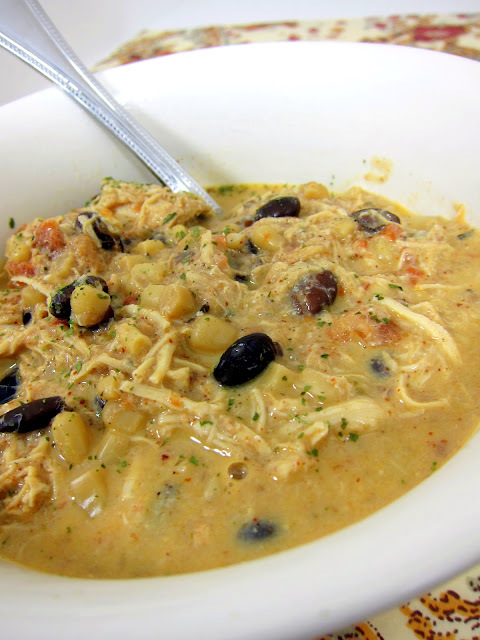 I love this Cream Cheese Chicken Chili! I have made it more the once now and it is a favorite at my house now. I found you on Pinterest and I am so happy that I did! This looks so yummy! I am curious to know if anyone has used non-fat plain greek yogurt instead of cream cheese? I might try it, but add the greek more at the end since in won't really have to melt.. This was really good! A friend told me it's even better if you add a can of chicken broth, so I did that. We really liked it. Jennifer - great tip! I'll give that a try next time I make this. Found this on Pinterest and made it last night. Sooo good! I used Rotel with Habaneros to spice it up a bit more.. And also used ground chicken so it would cook faster! How long should it cook if cooking on High? We found this recipe at the end of May and have been enjoying it about every other week since. For our family, I double the recipe, but only do one serving of chili powder and chilies. Less spicy for the kids that way. I've made this multiple times and it is so easy and so tasty! My book club LOVED it and everyone wanted the recipe afterwards. With my line of work the hours are crazy and that's why I love that you can thrown in all ingredients and come home to an awesome meal! I made this this week & should have read the comments. My consistency turned out somewhere between chili & dip, so I just should have added a little water. I modified it a little bit, as I can't have that much cheese due to salt content & I added a bit more Rotel. Tastes very good, at a thicker consistency, with Tostitos Scoops chips or wrapped up inside a small tortilla shell. I made this last night and it was so awesome! I kept coming back for more! I think next time i will double the recipe and add a little liquid/broth. A keeper!! Wow, this is SO GOOD. I don't like to cook, in fact I hate it, but I saw this on Pinterest and it was so easy I had to give it a go. Dump, dump, dump... set on low and come back to pure heavenly deliciousness! Just made this tonight! was a great hit. Will be making it again Trying your BBQ chicken tomorrow night! thanks for all the good recipies. Made this and entered it into our homecoming chili feed contest tonight...and it was the top vote getter! Thanks for the great recipe! What if you don't have a slow cooker? Aynsley - You can cook it on the stove for about 3 hours on low. Made this last night for dinner. I have pinned a lot of your recipes so now I'm just going to bookmark you site. YUMM! Make this for dinner tonight. Delicious!! Thanks! We tried this for dinner tonight and it was amazing. When it was finished, It was too thick for what we prefer for soup, as I was getting some water to thin it down, my husband grabbed chips and just started eating it that way (not realizing it was soup) So we just had it that way. I love happy food mistakes! Everyone loved it, including my very picky eater! I have chicken breast leftovers that are already cooked and would love to try this recipe. What should I do differently when using already cooked chicken? Makin' this tomorrow! I temporarily don't have a crockpot. Think I can simmer on the stove for a few hours? This looks so yummy. I defintely want to try it, but my husband and kids are so picky. If I don't put the Rotel in it will it still have good flavor? Is there any substitutes I could use instead? Try Salsa. That's what I used. Heather - it will still taste good without the Rotel. If they don't like chunks of tomato, you can puree the Rotel before adding it to the soup. If they don't like the spice of Rotel, just substitute diced tomatoes - you can puree those too. I am going to make this tomorrow. Can't wait! This is fab! I was out of Rotel (gasp) but I used a can of diced tomatoes and a can of green chili's. Super awesome! Oh- I also added some Velveeta cheese the last 30ish minutes. I can't wait to make this for a football or family gathering. Thanks! Tomi - I will have to try the Velveeta next time I make it. I think everything is better with Velveeta! Made this last week and we're making it again this week. SO GOOD! I am so glad that I found your blog. Best food blog I have found. Foods that I usually have the ingredients for and aren't too hard and are ALWAYS delish! Thanks for sharing! A-maz-ing! I made this for tonight's dinner and 3 out of 4 of us had seconds. I had leftover chicken so used that, didn't have ranch dressing mix so used an enchilada packet instead. I could have eaten more but needed to go to Zumba. ;) Thank you so much for such a delicious and easy recipe! I made this the other night for my husband and I and we LOVED it! He was hesitant at first to try it because he said it was "un-American" for chilli to be made with chicken lol! He loved it so much that he asked for me to make it again tonight! I don't have a slow cooker, so I poached the chicken with some onion garlic and kosher salt and just shredded it after it cooked and just did the rest in a pot on the stove. I did add a bit of crushed red pepper, black pepper, garlic powder and franks hot sauce. All I can say is that this was DELICIOUS! This is definitely a keeper!!! I made this today, didn't have black beans, used white, I have very potent chili and used only a teaspoon. I also added a chopped onion. It was SO good! Just made this, and it's really good! I think it's a bit too spicy though, so next time I might use less chili powder. I doubled it, and it was SO easy to make! Have you ever made this without the cream cheese or by substituting something for the cream cheese? I don't eat cheese, but was hoping to make do without or by subbing...thanks! Allison - not sure what you could substitute for the cream cheese - I would suggest other cheeses, but that doesn't help you. Maybe some sour cream? I have this in the crockpot right now..sooo excited to try it!!! Have you ever used beef in this recipe? I made this last night and we were fighting over who got to lick the pot--it was THAT GOOD!!!!! A keeper for sure! What's the desired temperature or crockpot setting? Help plz! thank you Stephaine...are most slow cook meals on low? This is an awesome recipe and a huge hit with our family. I added some green onions and chopped up half of a white onion instead of using onion powder and turns out amazing! Also added 2 c. water because I like my chili a little more on the soupy side. This was absolutely delicious! Everyone in my family loved it and can't wait for me to make it again. Thank you!!! This is a favorite in our house. I always have to double the recipe to have leftovers for lunch. This looks very delicious!is it very spicy?I like a little kick but not too much, if so could I reduce the cumin or chili powder or both? I must qualify my comment by stating that I am not a crockpot cook. I like to use fresh ingredients and no "cream of...". I was pleasantly surprised to see that the ingredients didn't include any "cream of..." and decided to give it a try. I was not disappointed! I did make a few modifications - used frozen corn, used 1 can of chicken stock, and did not use the Ranch packets. Instead, I added more spices (1 tsp oregano, 1 tsp cumin, 1 tsp paprika, 1 Tbsp chili powder, 1/2 tsp salt, 1/4 tsp pepper). I served it with fresh cilantro, and it was delicious! Perfect for a snowy, winter day. I made this for dinner the other night. It smelled SO good while it was cooking! I doubled the recipe and left out the beans, only because I didnt have any on hand but everything else was the same. I used Rotel with habaneros because that's what I had, as well. A couple hours before dinner time, I ended up in urgent care with my daughter but told hubby and son that they should go ahead and eat. Hubby texted me at the hospital to tell me, and I quote "this chili is bomb!" LOL He loved it! It was really spicy, even for me and I love spicy foods but that's my doing. The taste was fabulous. Thanks! Do you mix the ranch with directions on packet mor just put the ranch seasoning in the crockpot? So good! Once I shredded the chicken it soaked up all the liquid so instead of chili we had it in tortillas with a little cheese one night and over rice the next night. We will be doing both again. This sounded pretty good! I just put everything in the crock pot and look forward to seeing how it turns out! My husband is coming home from a business trip tonight, so I'm sure he'll appreciate it. I did make some modifications based on personal preference/convenience -- kidney beans instead of black beans, taco seasoning instead of the individual spices. I'll let you guys know how it turned out. Just made this today and boy is it awesome. I threw it all together in a matter of minutes. I also added some extra things i had in the pantry like canned mixed vegetables, bulgar wheat, and canned green chilis and it turned out amazing. It wasn't soupy at all but just really thick and flavorful. Thanks for the recipe! We really enjoyed this. The whole family ate it up! I will definitely be make this one again. thanks! I made this tonight... it was delicious. I added a little chicken broth to thin the sauce out a little. Thanks for the great recipe! Wow. This is REALLY good. Impressively flavorful for being so simple. My 4-year-old declares it "her best meal ever!" (A compliment she's never dished out before). Thank you! Leigh - WOW!! That is awesome. So glad it was a hit!! One of my favorite Pinterest recipes! I accidentally used cream corn once and it was even better! You can use Neufchâtel cream and the lower sodium beans and corn for a bit of a healthier version. I use 3-4lbs of frozen chicken tenders and it turns out fine you do not need to double the recipe just makes a lot more. I'm making this for the second time in two weeks. We love it! So yummy. I make this frequently in chilly weather. I always add a can of white beans and some half and half (eyeball the amount) to thicken it up and make it go further. Always delicious! Love this recipe! So glad you liked the chili! Love your additions. If I double the recipe, do I need to cook it any longer? Thanks! I wouldn't think so. Maybe just a few minutes, but probably not. I made this over the weekend and it was wonderful. Hubby asked for it for dinner again tonight. I did add some chicken broth to thin it out a bit. Next time I cook it, I'm going to add a can of regular diced tomatoes to add more juice and an additional flavor. Great with tortilla chips and garnished with shredded Mexican cheese. Making this for Halloween eve. I think I will use sour cream rather then cream cheese. Just sounds less heavy. Stephanie, thanks so much for sharing such a wonderful fall recipe! Can't wait to hear how the sour cream turns out. Enjoy! I'm also interested to hear how it works out with sour cream! Ok-I tripled the recipe (ya-I'm crazy that way!). Anyway, I did one part cream cheese and 2 parts sour cream. It was A.M.A.Z.I.N.G! This recipe is a keeper for me. I served mine over brown rice and it is a very fulfilling meal. Thanks again for sharing such a great slow cooker recipe. Glad to hear it is good with some sour cream! Made this at my work's chili cook-off and I won! Everyone loved it! I made this for church last night and everyone loved it!! I needed to make five times the original recipe, so I put 2x the ingredients in my oval crock pot and 1.5x the ingredients in each of the smaller round crockpots belonging to the church. Then once it was all done, we dumped it all into one big pot and served it with corn fritters. It was a huge hit and I had multiple people asking for the recipe! So if I double it, do I really need 2 packets of ranch (I don't really cook with this except to make dip!). Also what amount of boneless skinless chicken in terms of weight would you suggest for a double recipe? One more thing, since I'll be using 2 "bricks" of cream cheese should I melt it in advance of adding to the crockpot? I'm excited to try this as you have gotten so many amazing comments! Thank you. i have made this several times this fall. so great and EASY for a family! i half the cream cheese and its delicious! I have to tell you this is a big hit no matter where I take it. I am currently living on Guam and they love spicy so I just add some local boonie peppers and maybe a little extra chili powder and it is awesome! In the slow cooker now! Can't wait! Bought a can of chicken broth just in case I need to add toward the end. I'll let you know if the family gives it a thumbs up! Thanks for posting! And how much =a serving? if you double the recipe should you double the cream cheese also? This was so easy and very delicious! I doubled the whole thing except the cream cheese, I added 4 oz. cream cheese and 4 oz. of plain yogurt. It was awesome even before I added the cheese, next time I might try it without so it would be less calories. I didn't add the cheese until the end because I didn't have any in the house and brought it home from work after it was done. I just put this in my crock pot and now I am waiting. I make one adjustment, because I am not a black bean fan, I used home cooked navy beans. Wish me luck! Not a huge ranch fan. Is it overwhelmly ranch-y or is there something I can sub instead? Just made this last night. Huge hit! It needed a bit more liquid, probably because I cooked it a bit too long, but it was still awesome. I'm definitely making it again and I'll probably add a can of chicken broth next time. Either way, this was amazing! Just used 2 fairly large size chicken breasts (I was following the recipe!) only to find out in the comments I probably should've only used one... Oh well. It will still be delicious! I made this but only had the "Fiesta Ranch" on hand. Since the Fiesta Ranch is a little spicier, I skipped the chili powder and cumin, and will make it this way with Fiesta ranch every time! Everybody loved it and it was very flavorful! I will try the Fiesta Ranch next time! This us one of my husband's favorite things to eat. I double the recipe to have some to freeze for his lunches at work, but instead of doubling the corn, I add about 2 cups of hominy. The chicken doesn't have to be cooked first? I love this recipe! I found it a few years ago and won a chili contest at work! Today I'm using it for a luncheon at my school! Love it! After reading all the positive comments I can't believe I never saw this one or made it before. That will change soon! Thanks for ALL the great recipes. This was some of the best chili I've ever had! I will definitely be making it again. Thanks. Made this for a chili cook-off tonight and it's really good! I substituted diced onions for the onion powder. Also added some celery. Really nice flavor. frozen or non-frozen raw chicken breast halves ok? 5 or 6-qt cooker? Frozen or thawed chicken is fine. I have a 6-qt slow cooker, but 5-qt should be fine too. This was a big hit tonight. I didn't see the recipe until 5pm and it sounded so good I wanted it now so I adapted it for my pressure cooker. I had some cooked chicken so I threw that in the pressure cooker then added all the other ingredients. I cooked it at low pressure for 30 minutes then served it with cornbread. Boy, was I popular with the family. Thanks! Super easy and incredibly delicious! I loved how you can throw in frozen breasts, and I also appreciated that this only made a small-ish amount. I used Rotel with Habanero for an extra kick, and neufchatel cheese to cut down on the fat content a bit. I took this to a friend's house whose husband does not like beans, so I eliminated those. Bummer! I am making this again next week and will keep the beans. This is really good! Have made it many times for meatless Monday, subbing a couple of different types of beans for the chicken and serving it over brown rice. Delicious! Also have added sliced black olives to the mix at times. Very easy and quick to assemble! I have made this, as is, for years. We love it so much. Thank you! So I have never been concerned about using frozen chicken in recipes, but lately there have been a lot of warnings that you shouldn't do it. I am 37 and have lived this long, but am I flirting with disaster? I've used this recipe numerous time for a chili contest at work. I won 1st 3 years in a row, and 2nd the 4th year (because I didn't vote for myself). I tend to precook my chicken just so I don't have to wake up so early in the morning. And sometimes I'll mix it up with the Cilantro & Lime Rotel. I always give them the site for this recipe when they ask, "What's your recipe?" I have made this chili at least 50 times for the last 7 years. I’ve lost weight eating it to, as it is very healthy. Just put it into the crockpot for a perfect NFL Football playoff Sunday.